Stijn Vanmaeckelberghe from the Netherlands sent this picture. 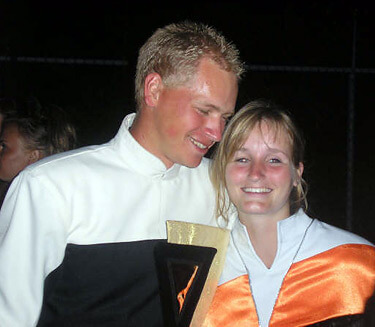 This is a photo of a member of the Glassmen (Toledo, Ohio) and a member of Jubal (the Netherlands, Europe). The photo was taken during the Glassmen's European tour while in the Netherlands. Jubal also went this year on a three week tour of the United States. During both tours, many friendships were made. Music/drum corps brings people together.